The LSM6DS3 is a system-in-package featuring a 3D digital accelerometer and a 3D digital gyroscope performing at 1.25 mA (up to 1.6 kHz ODR) in high-performance mode and enabling always-on low-power features for an optimal motion experience for the consumer. The LSM6DS3 supports main OS requirements, offering real, virtual and batch sensors with 8 kbyte for dynamic data batching. The LSM6DS3 has a full-scale acceleration range of ±2/±4/±8/±16 g and an angular rate range of ±125/±250/±500/±1000/±2000 dps. High robustness to mechanical shock makes the LSM6DS3 the preferred choice of system designers for the creation and manufacturing of reliable products. 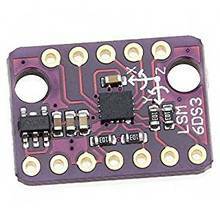 The LSM6DS3 is available in a plastic land grid array (LGA) package.